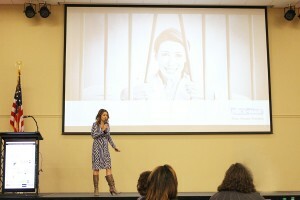 Are you an event organizer searching for an inspiring speaker for your women in business group? 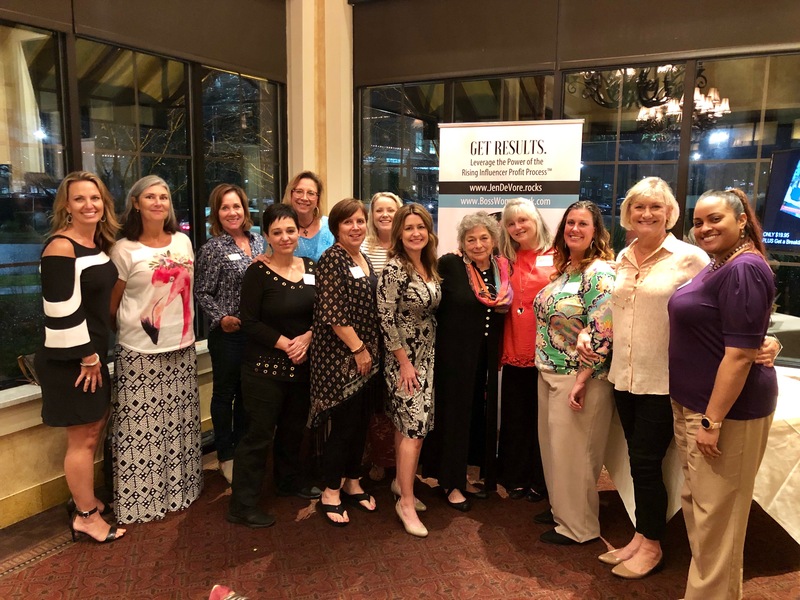 Recently, Jen DeVore Richter presented her signature program: Boss Women Rock – Go From Best Kept Secret to Sought After Expert to the Polka Dot Powerhouse Jacksonville Chapter. 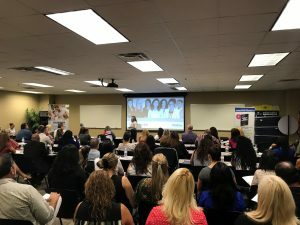 Interactive elements included each participant receiving their fill-in-the blank solution to creating a Market Dominating Position Statement and ended with the entire group standing in unison at the end to stand in a “power pose” and chant the Boss Women Rock mantra. 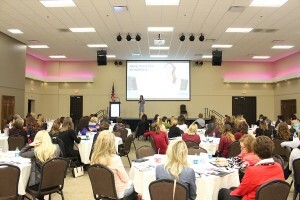 Women in business across the country love inspiring speaker Jen DeVore Richter. To inquire about booking Jen for your upcoming event, please call (904) 382-7255 or complete the Contact Form. Are you struggling to generate leads for your small business? The reason why may surprise you. 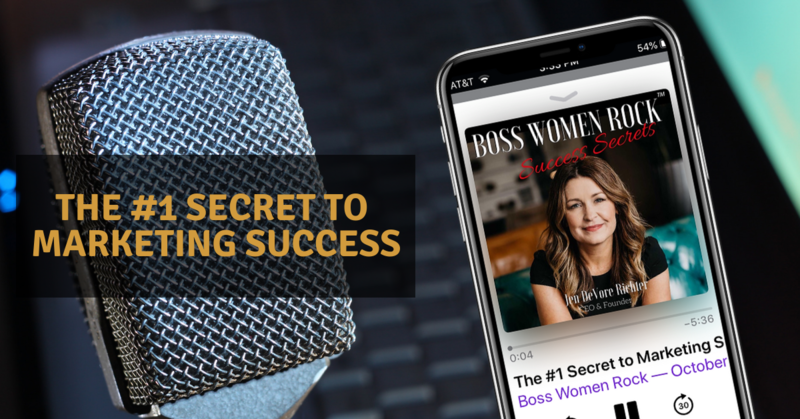 In this episode you’ll learn the #1 Secret to Marketing Success that most women in business don’t realize. You’ll gain a major competitive advantage. 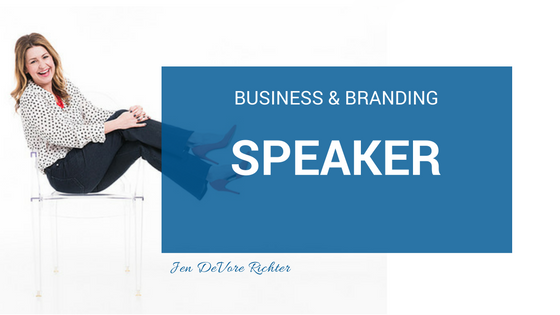 Jen DeVore Richter is a Business Breakthrough Specialist, published author, top business coach, keynote speaker, and media personality whose ideas and systems have been featured on NBC, CBS, FOX, ABC, PBS, and HuffPost. Did you know that business owners spend 80% of their time on tasks that DO NOT move their business forward? What if they knew that there were ONLY 5 AREAS of business that result in revenue growth AND they could predict the financial impact of these areas on their business? 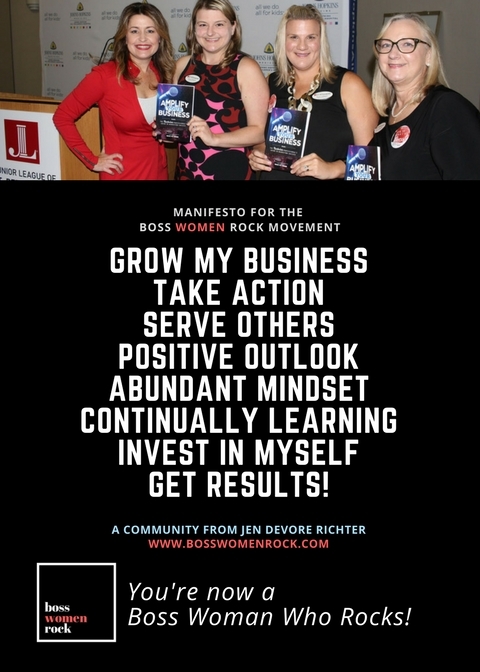 Boss Women Rock™ empowers your audience to cut out the time and money wasters and shows them the 5 areas that really matter. Keynote Speaker, Author, and Certified Magnetic Marketing Advisor Jen DeVore Richter shares the story of how she gave up a Fortune 500 career and a job at NASA to pursue her entrepreneurial dream. After a 15 year journey and building a seven-figure earning business, she’s now on a mission to empower women business owners to let go of what’s holding them back and finally get results. 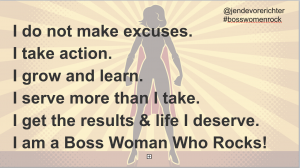 Boss Women Rock™ is a movement, a mission, and a community. 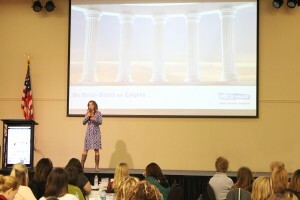 Book Jen DeVore Richter to present to your women in business group, conference, or organization. To check availability please email jen@jendevore.com or call (904) 382-7255. Women in business make great leaders. Yet only 5% of CEOs are women. 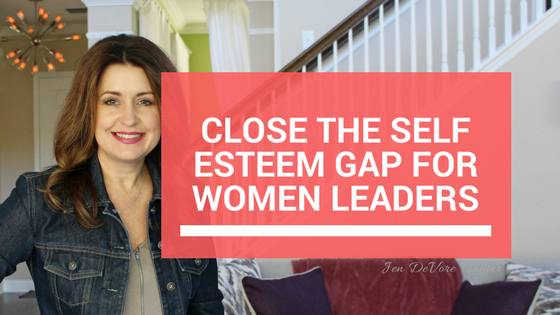 Women face unique challenges in leadership the most common being the self-esteem gap. According to research by DDI, confidence is the top leadership difference between men and women although there is NO difference in capability between men and women. Women are less likely to rate themselves as highly effective leaders. Organizations with women leaders financially perform better. 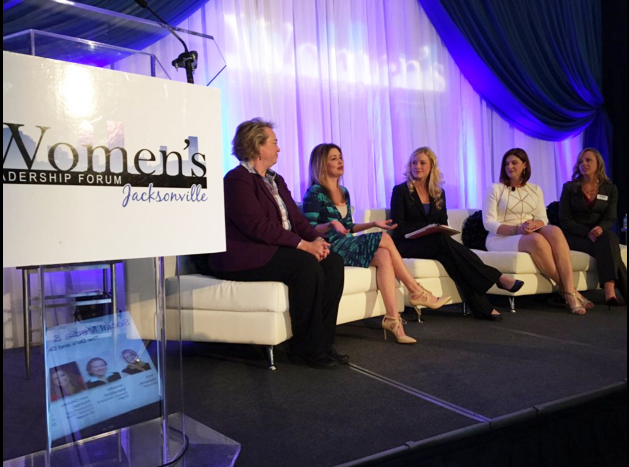 To learn how you can book a top women in business keynote speaker, please call (904) 382-7255 and inquire about booking Jen DeVore Richter for your women’s leadership conference. 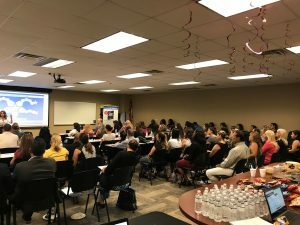 PRESS RELEASE – Jen DeVore Richter, Author & Keynote Speaker, Presents Business Growth Training at DR Horton Central Florida Headquarters for Real Estate Agents. 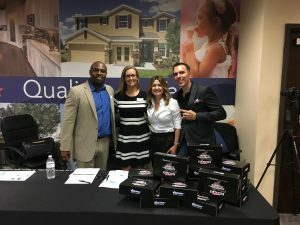 Event helps real estate agents from across the Central Florida area with elevating their marketing effectiveness using modern business growth strategies. 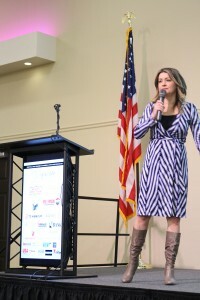 Jen DeVore Richter is a top speaker and trainer in real estate agents marketing. 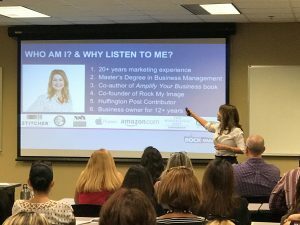 Jen DeVore Richter, author, professional speaker, and expert in small business marketing and personal branding presented a 2-hour personal branding training to a group of 90 top real estate agents at the DR Horton Central Florida Headquarters in Orlando, FL on Thursday, August 31, 2017. Jen DeVore Richter is a business growth expert serving as the pioneer of the “Identity Revolution.” She is known as The Powerhouse Producer for Rising Influencers. She cures the identity crisis many have in business helping you claim your stage and transform into a purpose filled leader. Her expertise in marketing and creative approach to business has culminated in the creation of the Rockstar Professional’s Blueprint™, which is a proven system she and her business partners developed over 4 years. 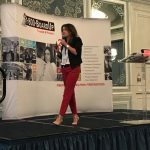 She has co-authored two books: Amplify Your Business: The Rockstar Professional’s Guide to Marketing Success as well as the Rockstar Professional’s 90 Day Action Planner. She is a Contributing Writer to the Huffington Post with featured articles on personal branding and small business marketing. Her podcast Purpose Filled Business is available on iTunes. 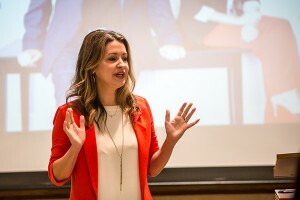 Jen is on a personal mission to encourage business owners to reinvent their lives, reenergize their businesses & reconnect to their purpose. 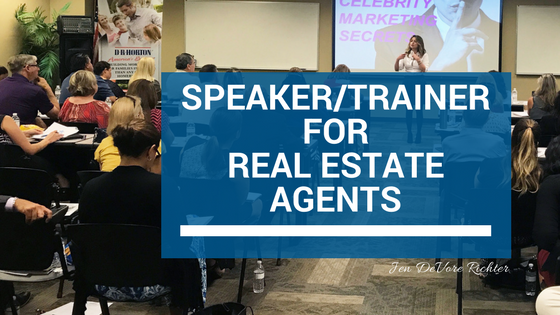 To book Jen as a keynote speaker for your real estate event, please call (904) 428.8764 or click HERE for webform. 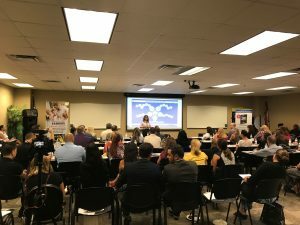 Event helps small business owners and franchise owners from national company 1800-BOARD-UP with elevating their marketing effectiveness using modern business growth strategies. 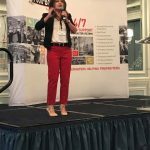 Charleston, SC – July 24, 2017 – Jen DeVore Richter, author, professional speaker, and expert in small business marketing and personal branding presented her signature keynote speaker presentation “Amplify Your Business” to a group of 110 company CEOs, owners, and marketing directors at the 1-800-BOARD-UP conference in Charleston, SC on Monday, July 24, 2017. 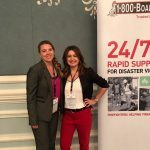 Conference Organizer Erin Gordon with Keynote Speaker Jen DeVore Richter in Charleston, SC. According to the meeting organizer, Erin Gordon, her presentation “received the highest reviews I have seen at 1800-BOARD-UP for keynote speakers!” Having known Jen as a business leader for many years, Erin was very pleased to have Jen speak. She has co-authored two books: Amplify Your Business: The Rockstar Professional’s Guide to Marketing Success as well as the Rockstar Professional’s 90 Day Action Planner. She is a Contributing Writer to the Huffington Post with featured articles on personal branding and small business marketing. Her podcast is available on iTunes. 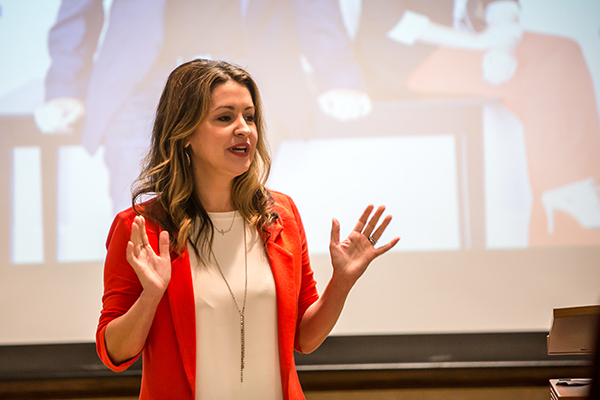 Jen is on a personal mission to encourage business owners to reinvent their lives, reenergize their businesses & reconnect to their purpose. 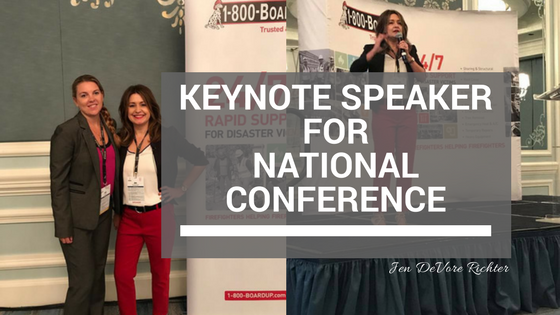 To book Jen as a keynote speaker for your event, please call (904) 428.8764 or click HERE for webform. 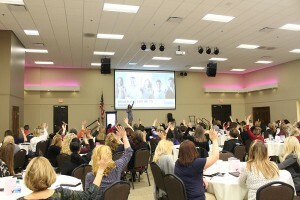 Are you booking a business motivational speaker, breakout leader, or keynote speaker for your next women’s leadership conference, meeting, or group? Looking for a professional, yet friendly and easy to work with entertaining speaker? Would your group benefit from an empowering and inspiring presentation from a nationally recognized authority marketing expert and published author? As a professionally trained speaker, actor, improv performer, and communication expert, Jen DeVore Richter receives raves reviews. 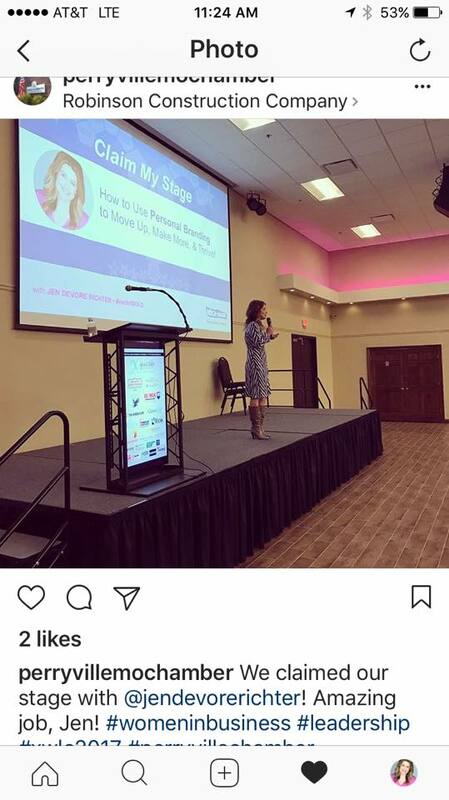 Jen was recently hired by the Perryville Chamber of Commerce as a keynote speaker to present Claim My Stage: How to Use Personal Branding to Move Up, Make More, and Thrive at the Xquisite Women’s Leadership Conference in Perryville, MO. 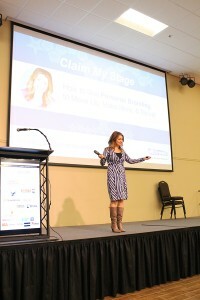 Jen shared her inspiring performance Claim My Stage, which motivates women business leaders to join the Identity Revolution happening now in business. She teaches the same techniques that celebrity entrepreneurs like Barbara Corcoran from Shark Tank and Oprah Winfrey use to be seen as authorities and thought leaders. Personal branding is a tool that can be leveraged to grow one’s business and influence. 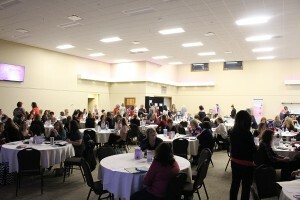 Over 100 women leaders were in attendance. Jen shared the frustration all business leaders sometimes feel and how to overcome it. The group was challenged to think bold visions of success. With heartfelt emotion, Jen connected with the audience. The entire group was engaged and entertained. The presentation was well received by all. The group thanked Jen with a standing ovation! 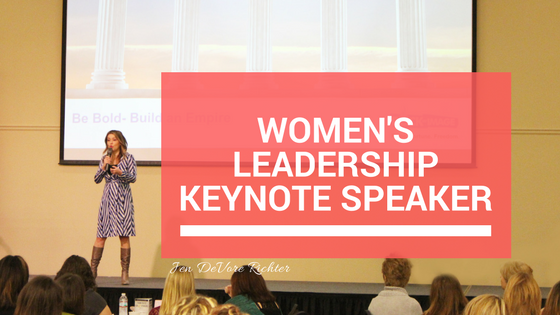 To book Jen to speak for your women’s leadership conference, group, or association, please call (904) 382-7255 or email jen@jendevore.com today. 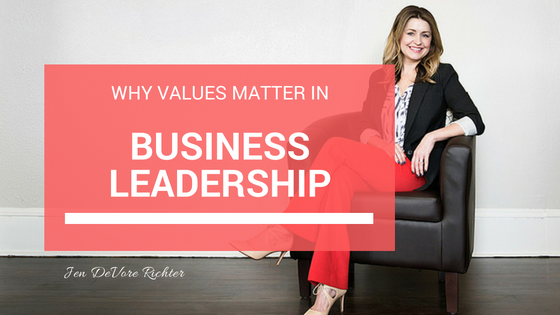 Values in business leadership is an important topic if you are interested in attracting like-minded people to you or your business. When you lead with your values, you can attract the perfect clients, hire the right employees and staff, find partnerships that will work, and find more fulfillment and purpose in what you do. Here’s a confession: When my business partners and I started Boss Women Rock in 2013, we made the mistake of not identifying our shared values up front. This result was that we attracted mismatched clients and dealt with a lot of frustration in the early years. It was hard for us to instantly see the repercussions of this since our business was booming and our client list was long. We actually had the problem of too many clients! But over time, what resulted was frustration from having to compete on price and just being seen as a commodity to a few of the business owners we worked with. Because we failed to identify and communicate our values early on, we were frequently stressed out because we were working on projects that didn’t give us purpose. We were having communication problems with mismatched clients who didn’t see eye-to-eye with our approach and we had less job satisfaction. There were so many days when I personally felt like giving up because I was not understood and respected. I had a change of heart when we started making tough decisions about the types of projects we would accept and who we wanted to work with. We took time to examine our business from afar and realized that we needed to do this work. We need to identify and communicate our values. Being true to self – trusting and having faith to be the person I am meant to be. Not an imitation or skin deep version. But showing up with everything that I am. Financial magnetism – valuing my experience and knowledge enough so that others will too. Getting paid what I’m worth and not accepting second best. Authority – owning my place as an expert in my field and sharing what I know in a way that is empowering and inspiring to others. Trustworthy & Integrity Filled Reputations that help build our brand and business. Passionate Spirits that keep us motivated and inspire others. Positive Attitudes about our work and lives. Bold Visions for our future and current success as well as our clients. Creative Minds to produce great work. Results Oriented Actions for a more effective approach. Fun, Playful Environments to make coming to work and working with us a joy. Smart People so we can learn from each other. Leadership Abilities to grow in our careers, lead by example and teach others. The result has been amazing since staying true to our values! In the last year, our revenue and profit is up while the number of projects we work on has gone down. Now, don’t be confused. This is a good thing! We’re working smarter and not harder. We’re working with the right clients that have shared vision and values. The result is that we have less stress and are happier at work on a day to day basis. So, how do you identify your values so that you can communicate them clearly and attract the perfect clients? The goal is to narrow down your values to the Top 3. To do this, start by creating a list of the values that your favorite existing clients have. This could be their corporate culture values and their personal values as well. Next, make a list of the values that describe your family members and friends. These are the people you enjoy being around the most and probably have the most in common with you. Then make a list of the values that your best employees, contractors, or partners have. Again, this can be their personal values. To wrap up the exercise, make a list of your values. Finally, you will look at your lists and combine like values together and eliminate the ones that are redundant or just not as strong. Narrow the list down to the top 6. Then narrow it down even further to the top 3. Because once you have your values identified, and you can communicate them, you too will experience greater satisfaction and fulfillment at work or in your business. The main takeaway here is to remember to establish your values upfront with your clients and colleagues. It will save you tons of time and unnecessary stress in the long run. Let your values be known, and you’ll attract the attention of like-minded individuals, setting you up for success. There are challenges every day that will feel like you’re taking one step forward and 2 steps back. There will be times when you feel frustrated, discouraged, beat up, unappreciated, and worn out. There are times we all need motivation. Most people in the spotlight in business don’t want to talk about the tough times. They want to only focus on the successes and gloss over the hard parts. But, that’s not reality. So, when you hit the tough times, you’ll feel like you’re doing something wrong or aren’t good enough, don’t have the right tools, education, training or whatever they’re trying to sell you. But, the truth is that failure and setbacks are part of the entrepreneurial journey. They’re part of mine and they are part of yours. My Why: Life with my husband Will. This photo was taken by photographer Catherine O’Hara in Paris on our wedding day in June 2013. So, identifying the WHY, is important because it will keep you focused, inspired, and motivated in a deeper way that goes beyond a catchy Instagram quote. Your WHY goes deep. It gets to the root and will motivate you to keep going when others quit. Most people haven’t taken the time to really think about the core reasons of Why they do what they do. A lot of people think money drives them but money alone is worthless. Of course you can buy things with money but are you working for things? Do things really drive people? To get to the core we’re going to go several layers deep into the Why you really do what you do. Start by answering simply why you do what you do? When you answer, ask why again and repeat six times until you truly find the core. This exercise is from Frank DeRaffele (www.frankderaffele.com) who spoke at a BNI conference. He told the story of how he was working with a man that seemed to be dissatisfied with his life despite the facts that he had a good paying job, a great family and had a lot of material things. On the surface, he appeared to have it all. But, in reality he was uninspired, unfulfilled and unmotivated. The core of the reason he worked hard was not to get money it was to be a better father for his kids than his father was to him. Money has been proven not to buy long term happiness. Money can not fuel a fire forever. When you have much more money than you’d ever need, what would be your motivation then? Finding the true reason for his efforts gave him something to stay passionate and committed to. The same can be said for the Why behind starting a business. The reasons Why you do what you do affects many factors that can contribute to your potential for success. So what is the real reason you’re in business? What is that inner purpose pushing you? How can you share it with the world and in your marketing? To force you to dig deeper so that you’ll have a tool that will keep you motivated when times get tough on your entrepreneurial or business journey. The main takeaway here is to really dig deep to find WHY you are doing what you’re doing. Because it may be for a different reason than the one you think. 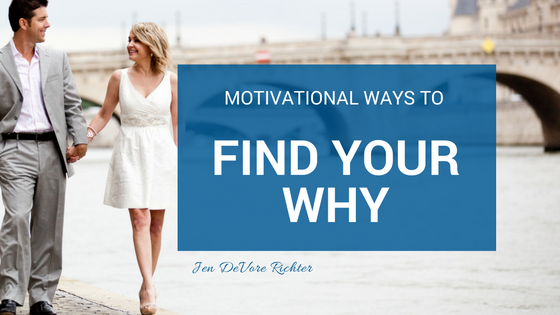 By finding your WHY, you will have something to stay motivated about. If you let that be the driving force behind your business, then there is no reason why you should ever doubt what you’re doing. 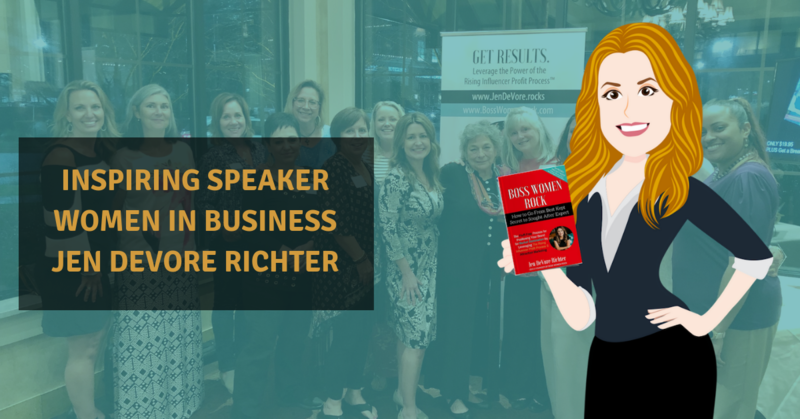 Jen DeVore Richter is a marketing expert, seasoned business owner and influencer often asked to speak professionally to women’s business groups. After an achievement filled career as a marketing executive with ABC TV, Kennedy Space Center, and a Fortune 500 pharma company, she made the transition into entrepreneurship in 2003. 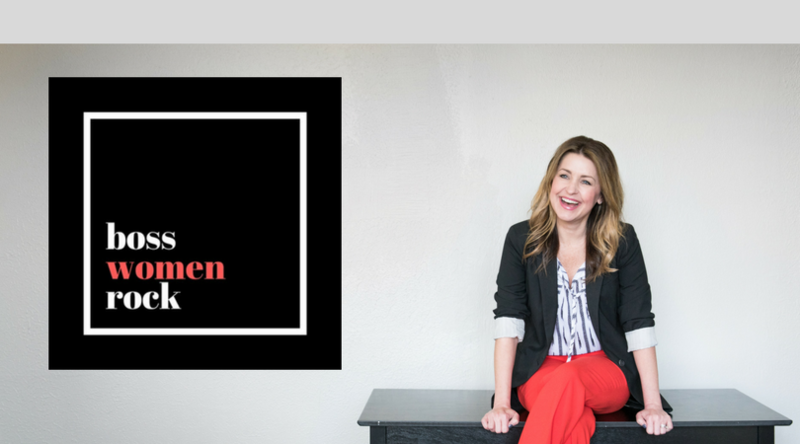 On the heels of running her own award-winning photography studio and then marketing consulting firm for 9 years, Jen co-founded Boss Women Rock where she spearheads strategic marketing for agency accounts and provides insightful solutions as a consultant. Her expertise in marketing and creative approach to business has culminated in a co-authored book, Amplify Your Business: The Rockstar Professional’s Guide to Marketing Success, now available on Amazon.com. She was recently named as a Contributing Writer to the Huffington Post with featured articles on personal branding and small business marketing. 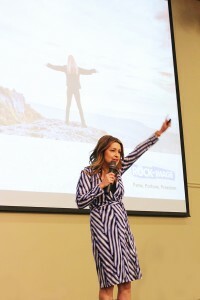 As a small business speaker, Jen is on a personal mission to encourage business owners to reinvent their lives, reenergize their businesses & reconnect to their purpose. To book Jen as a speaker for your group, please call (904) 382-7255 or tell us more by email. “Thank you so much for speaking to our chapter today! Your presentation got me really looking at my business, strategies, and the type of marketing I do.” – Angie P.